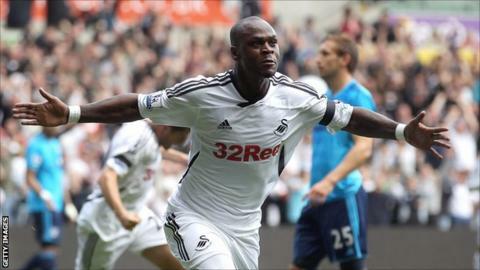 Birmingham City have agreed to sign Swansea striker Leroy Lita on a three-month loan deal. The 27-year-old passed a medical at St Andrew's on Thursday and will officially become a Blues player when the loan window opens at the weekend. Lita joined Swansea from Middlesbrough for £1.75m last August and scored twice in their debut Premier League campaign. But he has not featured in a competitive match for the Swans under new manager Michael Laudrup. Birmingham have scored just four goals in their four Championship matches so far this season and Blues boss Lee Clark was keen to add more attacking options to his squad. "I know Leroy very well having worked with him at Norwich during a loan spell in which he scored seven goals in 16 games," Clark told the club website. "He's a proven goalscorer who has power and pace and there's no doubt that he'll add quality to my squad." Lita has scored more than 100 senior goals in his career during spells with Bristol City, Reading, Charlton, Norwich, Middlesbrough and Swansea.